Impeccably kept 1 bdrm + den/solarium corner suite at “The Melville” one of the tallest all residential towers in Coal Harbour. This open plan with 9 ft ceiling features F/C windows, new laminate floors, S/S appliances & granite counters, W/I closet, electric fireplace & a BALCONY! Building amenities are among the finest in the city with rooftop pool & garden, quality gym, hot tub & sauna, recreation & media room & concierge 24/7. 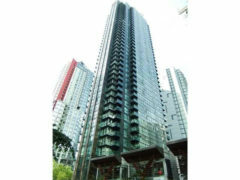 Fabulous location just steps to fashion & financial districts, Stanley Park, seawall, Canada Place & Convention Centre. This apartment exudes pride in ownership & has never been rented. 1 parking, 1 storage locker & insuite laundry are included. Non-smoking, problem free building, breathe easy!